The largest number of kites flown on a single line is 11,284, this record is held by a Japanese kite maker. The fastest recorded speed of a kite is over 120 mph. (193 km/h). for a train of kites 9740 metres (31,955 ft). The world record for the longest 'kite fly' is 180 hours. There are 78 rules in kite fighting in Thailand. The aeroplane is a development of the kite. For centuries kites have been used in wars and battles, for signalling, lifting observers, target practice, as barrage kites, dropping propaganda leaflets etc. The Chinese believe that when you tilt your head back to look at a kite in the sky your mouth opens slightly, which gets rid of excess body heat giving you a healthy yin-yang balance. The Chinese name for a kite is Fen Zheng, which means wind harp. The name is derived from early Chinese kites which used to carry wind musical instruments. The delta hang glider was a development of flexiwing kite called a Rogallo. The first powered aircraft were large box kites with motors fitted to them. The world-renowned father of aeronautical theory was Sir George Caley (1721 to 1790) who lived near Scarborough in Yorkshire. He discovered the difference between lift & thrust and invented the steerable tail and rudder. He also discovered the importance of the dihedral angle for stability of flight and knew the importance of a curved wing. If a lightweight engine had been invented in Sir George Caleys time he would have beaten the Wright brothers flight by over 150 years. Large kites were banned in East Germany because of the possibility of man lifting over the Berlin Wall. The fastest crossing of the English Channel towed by kites was 2hrs 30min by a team from Flexifoil International in 1999. They would have done it in 2hrs if the French Coastguards had not stopped them 1/2 a mile from the French coast. In 1985 I was presented to his HRH Prince Charles after winning a British Council travel award to visit kite festivals in China. He told me that whilst on honeymoon on the Royal Yacht Britannia he asked a crew member to launch his kite (a wedding present) from the rear of the yacht. The kite went up so fast the line burnt his hands - he had to let go and lost the kite. He said he learned two things that day, first you must wear gloves when flying kites and secondly remember to tell the Captain of the ship to slow down. in China", that the kite was the most important scientific device to have come to Europe from China. When the Japanese were building some of the early temples & shrines they used large kites to lift tiles and other materials to the workmen on the roofs. The Russians used kites to tow torpedoes in 1855 with great accuracy. Ancient stories of fire breathing Dragons were probably a windsock type of kite flown by soldiers in the middle ages which had burning tar in the mouth opening to frighten the enemy in battle. The para-gliders that brought back the first space capsules to earth were are development of the Rogallo Kite invented by Francis Rogallo in 1948. The Rogallo kite was the model for the first hang gliders. In 1826 there used to be a stage coach service between London and Bristol using kites instead of horses. There is at least one Kite Festival every weekend of the year in some part of the world. There are many indoor Kite Festivals. Kites have been used for centuries for fishing. Kites are used for bird scaring, forecasting the weather and frightening evil spirits away. Approximately 12 people are killed each year in kiting accidents throughout the world. It is now thought that the first kites flown over 3000 years ago, were made from leaves. In Indonesia leaf kites are still used for fishing. Kite flying is one of the fastest growing sports in the world. The Maori tribes from New Zealand made beautiful birdman kites made from bark cloth and leaves. Kite flying is popular in most countries except for one or two for example, Iceland and Russia, but we are trying to remedy that. Each year on the second Sunday of October kite flyers in nearly every country of the World unite and fly a kite to celebrate "ONE SKY ONE WORLD". People were flying kites 1,000years before paper was invented. Kites have been used for thousands of years to lift offerings and give thanks to the Gods for good harvests, fertility, weather and prosperity. Alexander Bell, the inventor of the telephone also developed the tetrahedral kite, which was very successfully used for man carrying. 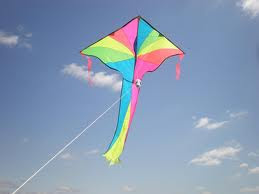 In the Orient, kites are given to someone to bring them happiness, good luck, prosperity and cure illness. The modern ram air parachute and para-gliders were developed from a parafoil kite invented by the American kite maker Domina Jalbert in 1963. Baden-Powell (the brother of the founder of the scout movement) did lots of successful experiment with man lifting kites. Samuel Franklin Cody who invented the Cody manlifting kite system was the first man to cross the English Channel towed by kites in 1903. In 1908 Samuel Franklin Cody was the first man in England to build and fly a powered aircraft, (a large box kite fitted with a small engine). Samuel Franklin Cody was the first man in England to be killed in a powered aircraft accident - 1913. In 1901 Marconi used a Hexagon kite to transmit the first radio signals across the Atlantic, the kite line was used as the aeriel. Lawrence Hargrave was an English man who emmigrated to Australia where he invented the box kite in 1893. In 1847, a young boy won a competition to fly and land a kite on the other side of the Niagara River. They then used the kite line to pull larger cables over the river, enabling them to start work on building the first railway bridge between Canada and the USA. One of the longest Chinese Dragons I have seen flying was over 600 metres long. Kites have been used in many sea rescues.